Oh, man. The feeding tube is out. He's coming home.. — :D feeling awesome. Kekoa's would-be Week 36 Gestational - He's doing awesome; he took a whole bottle for me and he's gaining good weight at 6 pounds, 8 ounces as of last night. Maybe another a week or two until he comes home; Can't wait!! :D ♥ ‪#‎TeamKekoa‬ — XD feeling excited. Three Weeks old today, getting better and better at eating on his own (without the help of the tube in his tummy), he's 6 pounds now! Just a couple more weeks until he'll be good and ready to go home; I can't wait!! ♥ #TeamKekoa — ^.^ feeling relaxed. As of last night, Kekoa's would-be 35th week gestational, he's off the oxygen!! And making great progress in weight-gaining as he is now 5 lbs, 10 oz! I can't wait to see and hold him again; I'm bringing my baby home soon! ‪#‎TeamKekoa‬ — ;) feeling optimistic. My Kekoa is Two Weeks old today. Got to go visit with him yesterday (Thank you, Grandma Janet!). They had him off the oxygen for a few hours, won't be long before he's off for good. He's starting to eat by bottle, I got to feed him myself. So, he's doing good. Just wish I could be with him until he can come home. ‪#‎TeamKekoa‬ — feeling incomplete. 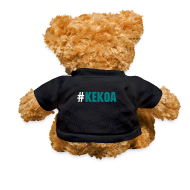 *Note: #"Team"Kekoa wouldn't fit on the teddy!! and we may get the headgear taken off as he's breathing better!! Things are definitely lookin' up. Copyright © 2002-14 the iMPish [Thing] All rights reserved.